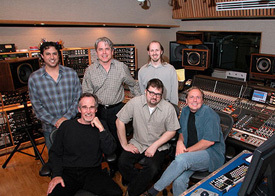 (rear L-R) Jeff Goodman, Neve; Jeff Levison, DTS Entertainment; and Brian Vibberts, assistant engineer. History: Joe Harley has had a love affair with jazz and blues music for as long as he can remember. Joe’s focus is to maximize the traditional studio experience by capturing the best performances-the musical juice-on tape. “I insist that the sonics serve the music, not the other way around,” says Harley. Harley has produced jazz recordings featuring such artists as Grover Washington Jr., John Abercrombie, Bennie Wallace, Charles Lloyd, Kenny Barron and James Newton. His blues resume includes sessions with Mighty Sam McClain, Ronnie Earl, Terry Evans, Ry Cooder and Doug MacLeod. In ’96 Harley formed his production company, Harley Music Productions. To date, Harley has produced over 70 recordings. Year 2000 included these great cd's produced by Joe Harley: Charles Lloyd, "Water Is Wide"; Robert Lockwood, Jr, "Delta Crossroads"; Mighty Sam McClain, "Blues for the Soul"; Weepin' Willie, "At Last, on Time"; Original Soundtrack, "Play It to the Bone"; Various Artists, "Telarc's Got More Blues". Current credits: A sneak preview of Joe’s recent work includes: Eden Atwood, one of the promising young jazz singers to emerge during the 1990s titled: Waves: The Bossa Nova Session; Joe Beard's Dealin which shows who some of Beard's influences are, but it also reminds you that he is an appealing bluesman in his own right. Joe produced jazz pianists Bill Cunliffe's " Live at Bernie's" and Kei Akagi's "New Singles & Travelled Miles. " Joe was the producer and creative director for Jacintha's third album, "Lush Life" for Groove Note and he also produced bluesman Terry Evans' "Mississippi Magic." Stay tuned for more great music from Harley Music Productions. Harley produced acclaimed jazz group Medeski, Martin and Wood and created a 6.1 Surround mix of their "Uninvisible" album for DTS Entertainment in the new Studio D at Ocean Way with the help of Surround engineer Michael C Ross. 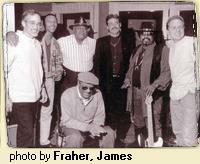 L-R: Joe Harley & studio bluesmen with engineer Michael C. Ross (far right).